Ingredients: Fine flake sea salt, naturally smoked chiles (incl. Peruvian Paprika, New Mexico, & Chipotle Morita), extra fine raw cane sugar, black pepper, crystallized lime juice, garlic, onion, white pepper, other spices & maltodextrin (from corn). 100% All Natural with NO MSG, no fillers, artificial colors, flavors or additives. Nutrition Facts: Serv. Size: 1/4 tsp (1.2g), Servings per Container: Varies, Amount per Serving: Calories: 0, Fat Cal. 0, Total Fat: 0g (0% DV), Sat. Fat: 0g (0% DV), Trans. Fat: 0g, Cholest. 0mg (0% DV), Sodium: 168mg (7% DV), Total Carb. 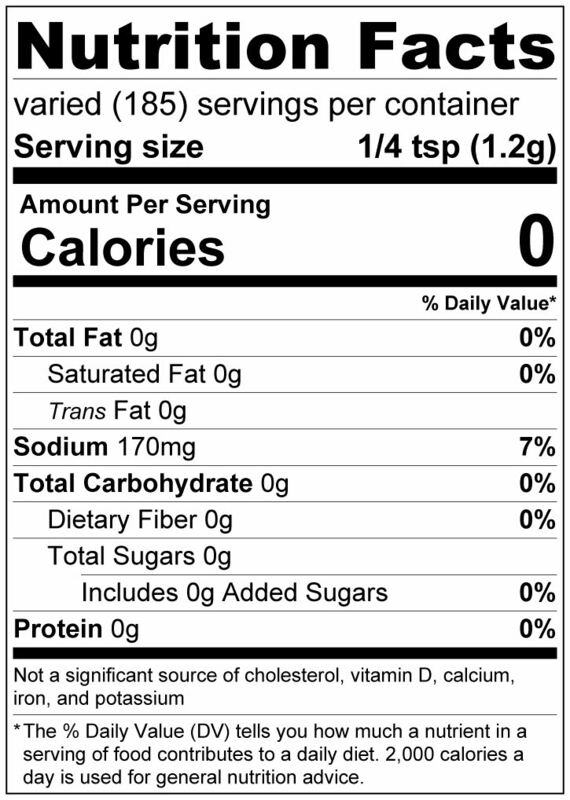 0.3g (<1% DV), Fiber 0g (0% DV), Sugars 0.3g, Protein 0g (0% DV), Not a significant source of vitamins and minerals. Percent Daily Values (DV) based on a 2,000 calorie diet.